Duck the Halls: A Mickey Mouse Christmas Special (2016) tells the story about a Christmas that goes horribly wrong. In this special, Donal Duck has never experienced Christmas and decides to stay during the winter months, instead of flying south like the rest of his duck brethren. What follows is an antics laden special that actually surprised me. It debuted on December 9th, 2016. To be clear, this is the first and only animated short from the newly created Mickey Mouse shorts that I have seen to date. I happened upon the holiday special completely by accident as I searched for some Christmas themed movie or show to watch with my son and daughter. So I went into this short blindly, with no prior knowledge except that of classic and recent Disney masterpieces. One of the best things about this short was the animation. It was different than the highly realistic (I guess you could say), fluent, and mostly on model cartoons that I've known Disney for. By that, I compare it to things like The Goofy Movie or Fantasia. Yes, I realize that there were the early shorts like Steamboat Willie from 1928, that had a very over exaggerated, rubber hose style. But Disney soon started moving towards animation that was more subtle and lifelike. Yes, still cartoony, with amazing poses and facial expressions, but it was never something that fell into model breaking poses. I think you know what I mean? 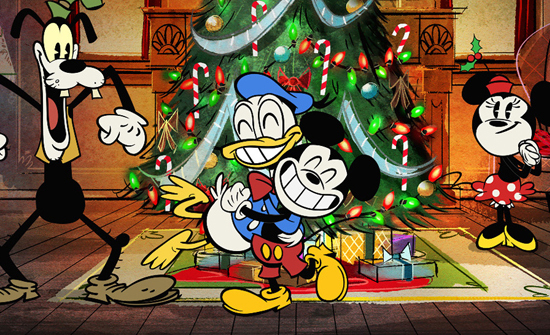 Duck the Halls heavy, stylized, puppet-look brought back memories of the original Steamboat Willie era. It also added a fresh take on Disney animation, as far as television goes, and what I've come to expect from the house of mouse. It also reminded me of something that just wasn't inherently Disney? It felt like a hybrid that I'd see air on Cartoon Network, mixed with some of the darker themes from something like Ren & Stimpy. Which brings me to the humor. I literally laughed out loud during a few special moments. It was unlike anything I've ever seen or expected from Disney. To date, I've come to expect safe and wholesome. They're not really known for taking too many risks with their animation. By that, I mean shows like Disney's House of Mouse and the like on Disney XD. But in Duck the Halls there were moments that were right on the edge of something that would be unacceptable to the company. And it made it absolutely hilarious! This may be entering spoiler territory, but a few of the offhand jokes that made me lose it were just so out of nowhere. One particular moment was the sing along that follows Donald's steady decline as he tries to withstand the winter temperature. He just gets more sickly as time progresses. It's horrifying because he's eventually on his death bed, but a riot to watch! Another funny moment is when Mickey, Goofy, Minnie, and Pluto decide to hijack Santa's sleigh instead of asking for his help (which is what I thought was going to happen). It was so out of character for Disney that I couldn't stop smiling. And lastly, when Goofy finds a roasted chicken, assumes it's Donald, and says, “Even in death, he smells delicious.” I was in tears! The main cast have also had character design upgrades to go along with the new style of animation and humor. Most notably is Goofy, who looks more, well? Goofy. No longer the well-meaning, albeit clumsy, beanpole that I've known since the old days. He now has a large, wagging jaw, a bent posture, and drooping eyes. His personality is completely different, too. If there's anything I can compare him to it's Patrick Star. He's dumb and just doesn't seem to be all there, which makes him really entertaining. Now, while I did really enjoy Duck the Halls, I have to admit that it felt too short. This is a slight nitpick, but I was thinking that it was going to be an hour long special. It's actually the longest Mickey Mouse short, as of this writing, to date, so there is that. But I truthfully could have spent at least 30 more minutes watching everything go absolutely bonkers. Also, it felt like it was trying too much to imitate the competition. Like I said, everyone felt out of character. I felt flickers of SpongeBob in Mickey, Patrick Star in Goofy, and like I said the whole episode seemed out of place in the Disney Universe, and also had humor that just didn't feel like Disney as a whole. It was just really different. But as I said this is the first episode I've seen, so maybe Disney has been moving in this direction for awhile now. I'm just speaking from my own perspective, and I stopped watching Disney in any form a long time ago, if it wasn't a movie. Overall though, this was an interesting and very welcome change to Disney's animation and style. I couldn't help but literally burst out laughing a few times, and the risks they took, in lieu of some of the more safer decisions I've come to know in their most recent animations, is a direction I wholeheartedly embrace! It's still the same old characters, just a bit more quirky, odd, with animated motion like that of the 1920s. A great mix of old and new. It's definitely entertaining, and something you should give a watch if you have the time, or just have an inkling for something a little bit outlandish.